In A Lab of One’s Own: Science and Suffrage in the First World War, Patricia Fara follows the trajectories of women scientists during World War One, describing their struggles in academia and laboratories in tandem with the battle for the vote and the war unfolding across various fronts. Cléo Chassonnery-Zaïgouche praises the book for its complex and nuanced account of the changing status of women scientists in the early twentieth century. A Lab of One’s Own: Science and Suffrage in the First World War. Patricia Fara. Oxford University Press. 2018. 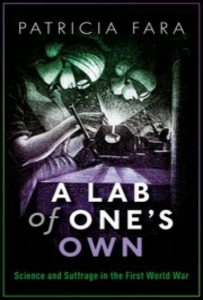 A Lab of One’s Own is a great title for an important book. Many women scientists opposed Virginia Woolf’s separation of women’s and men’s creativity as presented in her essay, “A Room of One’s Own”. They endorsed, instead, an ideal of science as a universal culture. In this book, Patricia Fara delivers rich and diverse narratives concerning how women’s views on science related to their different experiences in practising sciences. World War One was a moment of “gender reckoning”, when dramatic new discourses on women formed in the wake of rapidly changing events. Uncovering these many voices from and on women’s contributions is a way to counter the “Matilda effect” (women being washed out of history), but also to shed some light on struggles with contemporary relevance. While the more obvious forms of discrimination have decreased, women in the sciences today are still facing gender inequality, from glass ceilings to leaky pipelines. Fara is very clear that telling a narrative about the past is part of changing the present situation. In this concise book, we follow the trajectories of women scientists and their struggle in academia, for the right to vote and on the fronts, whether on the battlefields in continental Europe or as part of the British “home front”. The general impression is one of forgotten dramatic changes driven by a complex set of characters. Despite being relatively few in number, these women had a huge impact on the way World War One was fought. Fara paints all the nuances of these trajectories, keeping in the background the specificities of a war economy, the instrumental place of science within it and the ambiguities and new challenges faced by women. In line with current historiography, narratives describing the war as a dramatic turning point pave the way to a general story of “a temporary opening up of opportunities before the door clanged shut once again” (11). While acknowledging the post-war backlash, Fara nevertheless underlines how some “attitudes, expectations and emotions had altered” (273). A Lab of One’s Own is composed of five parts. The first section sets the context of women’s education prior to World War One and the escalating suffrage movement until the war broke (Chapters One and Two). Chapter Three carefully records the growing importance of sciences on women, and their contestation of some of its approaches. Scientific knowledge worked both ways: it could function as an aid to find reasons for women’s supposed inferiority or as the primary weapon to expose prejudice as unscientific. The second part of the book describes how previous educational trends enabled women to enter the scientific workforce during the war (Chapter Four). Chapter Five offers an initial tour of the many ambiguities of the war experience for women: it was seen and politically organised as a breaking point for the necessity of the war effort, while the many successes — in factories, labs and at the front — did not mean equal treatment and recognition at all. As in each subsequent section, Fara describes more precisely the trajectory of certain individuals: in Chapter Six, this is Ray (Costelloe) Strachey, following her from her studies in mathematics and her cricket successes at Newnham, Cambridge, to her tremendous impact as a suffragist. The third part is devoted to “scientists in petticoats”. In Chapter Seven, Fara uncovers the “hidden heritage” of women’s work as assistants in “home labs” during the nineteenth century and the fight to access university labs. Resistance to integration sometimes led to the creation of women’s own labs, such as the Balfour Laboratory at Cambridge. Fara describes the scientific subculture created in these places as a mix of rebellion and conformity to gender roles. The changing status of women in science greatly evolved in relation to the rise of a new regime of “industrial, government, and scientific cooperation” (146), fostered by what became branded as “the chemists’ war” (Chapter Eight). Disruptions to women’s lives included taking men’s places and the radical transformation of their own spaces, such as women’s colleges being changed into military hospitals (Chapter Nine). The chemists Ida Smedley and Martha Whiteley both actively campaigned for suffrage and the place of women in science. The first woman to be hired at Manchester University and to receive a prestigious fellowship, Smedley was behind the industrial-scale production of acetone during the war, although credit has usually been given to a male scientist (173). Whiteley led an independent career at Imperial College on the well-established subject of organic molecules, but during the war she managed a seven-woman team that developed mustard gas, sometimes experimenting on themselves. Bounded by military secrecy, little was known of her work after the war. In the fourth section, Fara turns to women’s military work (Chapter Eleven). The first topic is espionage and code-breaking by women—a topic which is well-known in relation to the Second World War but largely neglected for the First. Describing the “domestic warriors” employed in the auxiliary forces, the Women Land Army and the home hospitals, Fara underlines the discovery of and the claim for more freedom, as well as the experience of mixed-gender work environments. Here, we follow women on the front, including botanist Helen Gwynne Vaughan, head of the brand-new Women’s Auxiliary Army Corps (WAAC), to France as well as surgeon Isabel Emslie Hutton from Scotland to Sebastopol. The two last chapters remind us that the past is never really past, and trace continuities with pervasive forms of discrimination faced by women in science today. The book closes on a self-reflective section in which Fara discusses why she herself did not study gender issues in the sciences before writing A Lab of One’s Own. Some elements run through the book as a red thread. Networks of women play a central role in the history of women’s education and work, from suffrage to upper-middle-class women’s philanthropic connections. These networks usually went back to women’s colleges, and to the work of a previous generation of women who pioneered access to education. A very interesting and transversal element is the difference between Oxbridge and the emergence of women in the “red brick” universities. Just as technology opened opportunities for women in fields so new that they were not yet presumed to be the preserve of men, changing institutional landscape produced interstices where women could be accommodated. A Lab of One’s Own also explores the impact of war work on identity and emotions. The social pressure imposed on women to be “domestic goddesses as well as superwomen scientists” (276) feels familiar to a contemporary reader. As do the debates on the way marital and family status unilaterally impacted women. Also recognisable are the specialisations of women in specific activities or disciplines: e.g. botany, nutrition science and chemistry. The relation between gender in science and the gender of the sciences is not discussed in its generality, while Fara carefully underlines the way the “care” professions were divided on gender lines. Two notable absences in the book, however, are the social sciences and the pacifists. First, Fara gives us some hints of changing views on women, but does not discuss the development of knowledge produced by women in the social sciences. Fara misses the opportunity to discuss the interplay of statistics, eugenics and social science in the definition of the proper sphere of women’s manual as well as intellectual work. Here, the book could have mentioned, for example the work of physician and medical officer Janet M. Campbell and that of economist and co-founder of the London School of Economics, Beatrice Webb, for the War Cabinet Committee on Women in Industry (the “Atkin Committee”), which was charged during the war with determining the efficiency of women and whether equal pay should be granted in industry and civil services. Second, the struggle for the vote united women around a common cause, but women in general, and I imagine women scientists, had different attitudes to the war and the British empire, from pacifist to jingoist. We don’t hear about women (scientists) who opposed the war or the diversity of political opinions they held apart from with regards to the vote. These two last remarks are perspectives rather than criticisms. 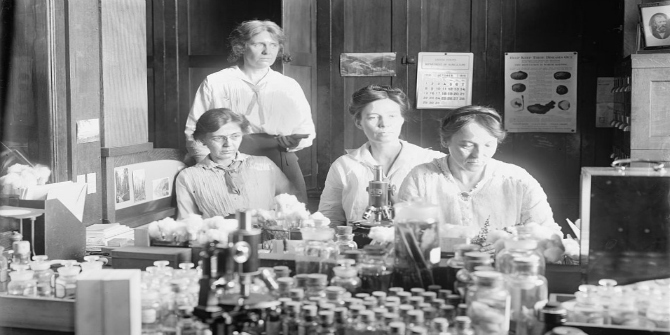 A Lab of One’s Own provides a complex picture of the status of women scientists in the early years of the twentieth century and what the First World War actually changed. While not a revolution for women, the war did transform a limited number of attitudes and practices, which would be again, and with renewed tension, forced back to centre stage in the subsequent World War.